This elegant master closet design evokes story book tales of palaces with rooms fit for a queen. The custom closet is designed as a personal sanctuary for an elegant lady and rises above the physical challenge of angled walls to transform what might have been a problem space into a luxurious custom closet/dressing room suite. A large center island provides plenty of drawers, while a custom wall unit centered in the alcove created by the angled walls provides even more drawer storage. The dresser is positioned below an story book style oval window, mimicking the look of a traditional dresser/mirror combination, but the custom size and finish ensures the piece will fit seamlessly with the size and style of the room. 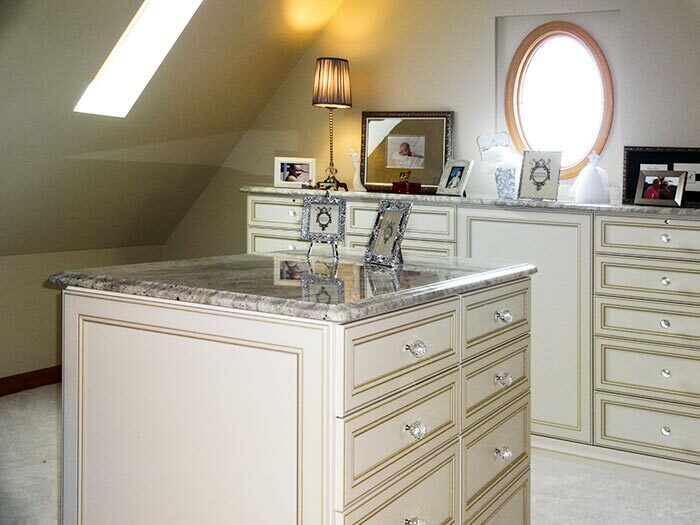 Marble countertops and premium crystal knobs complete the polished look of these custom closet pieces and pick up the silver and crystal tones in the homeowners collection of decorative picture frames. Hanging space for an extensive wardrobe is provided by positioning the hanging rods at various heights, ensuring maximum storage per square foot. Many homes feature closets that are located over a garage or other area with heavily sloped or angled walls and can be a significant challenge to design. Closet Works can transform any potential problems into beautiful spaces that add functionality and beauty to a home — It just may end up as your favorite part of the house. 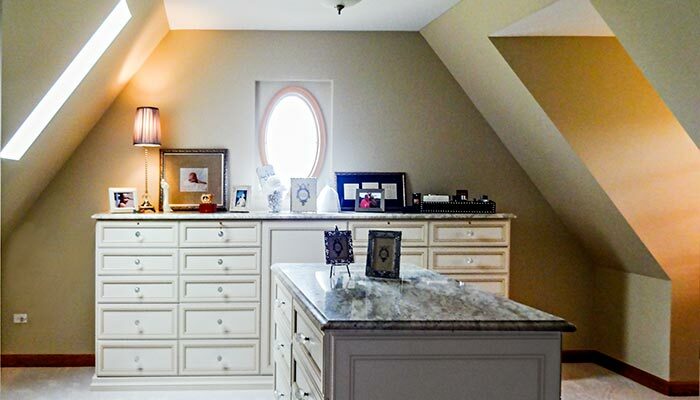 Bonus room over garage with funny angled walls was transformed into an elegant master closet/dressing room suite. Elegant closets solution for room with challenging angled walls. 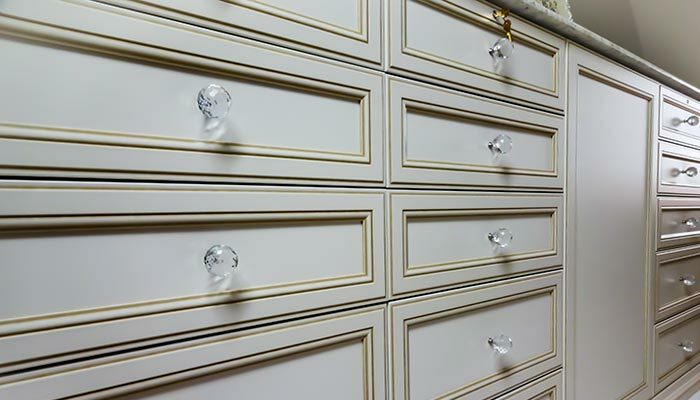 Crystal knobs adorn the drawer fonts on this elegant closet center island.